I got a call from a colleague who was asking why the Windows directory on a Windows Server 2008 R2 machine was taking up almost 40GB of disk space. I checked one of my servers and noticed almost the same – about 30GB on mine. He noticed more readily than I did because his Windows install was on a partitioned drive where the C volume was only 60GB. I, however, do not practice partitioning drives. If I want more volumes, I get more drives. After some research, we noticed that the WinSXS fold was the culprit. He was about to delete the folder when I asked him to stop. I found it hard to believe this folder was so large just for the fun of it so I did some research. I found many blogs and so forth that “tried” to explain the WinSXS folder, but most failed horribly. As always, if you want the low down you have to go to the source. I found this post on the Microsoft Ask The Core Team blog that did a fantastic job of explaining the WinSXS folder. I highly recommend giving this post a full read. You should also subscribe to the Ask The Core Team blog. Do not partition out a single drive into multiple partitions. If you want your OS on one volume and your data on another volume, then get multiple drives and place one set of drives in one volume for the OS and the rest of the drives in a volume for data. For example, you could do a RAID 1 for the OS and a RAID 5 for data. This way, you’ll always have plenty of room for the OS. Partitioning one drive into multiple volumes, in my opinion, makes little sense any more. Install only those applications you need on the computer. The more applications you install, the more your C drive will fill up. The same is true for Windows features. Install only those you need. Run the disk cleanup wizard. You can free up some space by removing the roll back files for the last service pack you installed. That last point bears some discussion. When you install a service pack for Windows, you can always uninstall it. This is made possible by the fact that Windows stores copies of the original files replaced by the service pack in the WinSXS folder. If you have been running the service pack for a while and are very confident you will never need to uninstall it, you can remove the backup files which will make the service pack permanent (you can’t remove it). On one of my systems, this freed up 10GB of disk space. Open a command prompt and run the command VSP1CLN.EXE. This file is found in the %windir%\system32\ directory. Open a command prompt and run the command COMPCLN.EXE. This file is found in the %windir%\system32\ directory. Again, be reminded that should you run any of the commands above, the service pack will become permanent. You will not be able to uninstall it. However, you will free up some pretty significant disk space. Be certain to test on a test machine before running this on a production computer. You installed the Windows Internal Database role on Server 2008 64-bit. You installed the WSUS role on the same server and set it to use the Windows Internal Database. One day, you notice WSUS is not giving out updates and you cannot start the WSUS management console. It tells you that SQL may not be started on the machine. Delete the SUSDB database and log file. This file will create and empty SUSDB database. Once this is done, you can now remove WSUS from your server and re-install it if you need it back. I recommend reinstallation as that will put your settings back in place like you had them. Remember, the SUSDB you just created is empty with no tables in it. I hope this information helps. If anyone has a better solution, please add it to the comments section. Mr. Raymond Chen of Microsoft has made an interesting post on his blog regarding the TEMP directory in Windows. In his post, he states that “The TEMP directory is a dumping ground of random junk.” He’s quite correct. Many programs, including installers, use the TEMP directory for storing temporary data. Unfortunately, there are many programs who use the TEMP directory for permanent storage. Obviously, as time moves on, some of these programs are bound to bump heads as they copy files with the same name, etc. to that same directory. The most common issue I have seen is installations failing because of stuff left behind from previous installs. Fortunately, there is a fix that I have found works often. 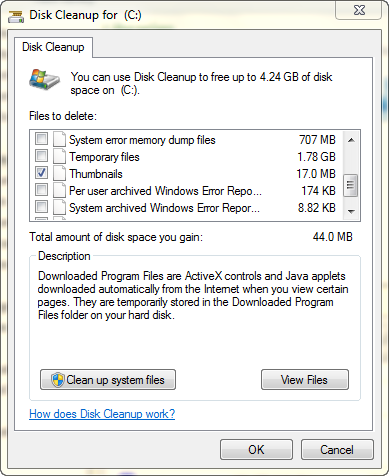 Use the disk cleanup tool in Windows. Open up Windows Explorer, go to My Computer, and then right-click your C drive and choose Properties. You should see a button called Disk Cleanup right there on the General tab. You will want to change some of the options for the Disk Cleanup tool to make sure it does get temporary files. Once you run the wizard, you should have a few Gigs back on your drive and the issue with files in the TEMP folder interfering with new installs should be mitigated. After doing an in-place upgrade of SharePoint 3.0 to SharePoint Foundation 2010, you may receive this error on both your SharePoint site and the Central Administration Tool. The cause of this problem for me was the application pools in IIS not being set properly after the upgrade. In IIS 7.0, expand your web server and go to Application Pools. As the picture above indicates, both the SharePoint Central Administration v3 and the SharePoint – 80 application pools are set to “No Managed Code.” They should be set to .NET Framework version 2.0.50727. Once you make the change your SharePoint sites should come up. Do note that it may take a moment for the site to display since the .Net runtime has to be spun up. By default, the Juniper SRX100 and SRX210 set up fe-0/0/0 as your Internet connection interface and the rest of the interfaces (fe-0/0/1 – fe-0/0/7 on the SRX100) as switching ports on a single vLAN. It is not uncommon for a network to require more than one vLAN for either political or technical reasons. For my home, in which I am using a SRX100, I have the reason in that I want my family computers on one vLAN and my Dell T310 server with all my test virtual machines on other vLANs. This way issues such as my test Small Business Server 2003 machine, with its own DHCP server, will not interfere with other computers which belong to my family (my wife has a mini-laptop, we also have an XBox). Furthermore, I could go further by setting up a Windows Server 2012 Essentials machine with its own DHCP server as well and it would not interfere with the SBS 2003 virtual machine nor the family machines. As long as everyone is on their own vLAN, all should be well. Now, we need to go to the actual vlan settings of the SRX. 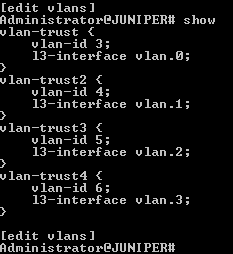 Type top to get out of interfaces and back to the top of the configuration tree, then type edit vlans. Type the following three set commands to create new vlans we will tie into our interface. Our last step is to configure DHCP for one of the vlans. I need DHCP for only one of the vlans as the other two with have a server such as Windows Server 2012 Essentials as the DHCP server. Type top to make sure you are at the top of the configuration tree. Then type edit system services dhcp. Once you are done with that, do a commit confirmed 5 which will commit your settings but give you 3 minutes to type confirmed again before rolling you back. This way, if a mistake is made, you will get back to your last known good configuration and can try again. While waiting your 5 minutes, be sure to connect a computer to the other interfaces on the device to see if they get connectivity. 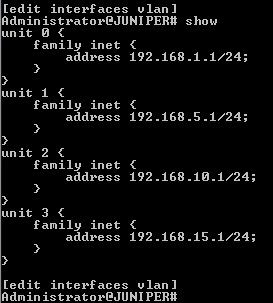 For those interfaces without DHCP, you’ll need to statically assign an IP address. Once you verify all is well, type commit again to make the changes permanent before you are rolled back. We now have three vLANs on our SRX. One vLAN with interfaces fe-0/01 through fe-0/0/4 with DHCP, one at fe-0/0/5 without DHCP, one at fe-0/0/6 without DHCP, and one at fe-0/0/7 with DHCP. The table below summarizes. As far as security goes, all the vLANs belong to the trust zone and follow all the policies of that zone. Later on we will look at putting vLANs into their own zones so we can have more granular control over security. Again, if you close your session in SQL Server, the above table will be dropped then and there. This makes temporary tables in SQL Server very useful to SSIS as they clean up after themselves. Unfortunately, there are many of us who are still having to deal with all those pesky Access 200x databases running around. And, unfortunately, Access does not support temporary tables like SQL Server does. When you create a table in Access, it is there to stay unless you specifically drop it by executing a DROP TABLE statement. In SSIS, this leads to a bit of a problem. Let’s say your package fails for whatever reason (lost connection to server, power went out, etc.) before it gets to the step where you clean up all those temporary Access tables (i.e. you have an Execute SQL step that has one or more DROP TABLE statements in it). The next time that same package is scheduled to run it’s just going to fail again when it gets to the step where you create your temporary tables in your Access database because those tables already exist. Notice that this code checks for three tables: Demograhpics, newBills, and newTrans. You can, of course, keep adding “if” statements to check for your temporary tables or you can pass in an object variable that you can loop through that checks for a list of tables. This way, if your packages fails for some reason during one run, on the next run any temporary tables in Access will be dropped before the task that creates them executes. There may be other more elegant ways to handle this problem. If I think of any, I’ll post them. You, of course, are welcome to mention other ways in the comments section.